For most its existence, 80-year-old Renfro was a sleepy Fort Worth company with a few steady products. “A happy sound—jars clinking together,” beams Doug Renfro as he dons gauzy hair and beard nets. The production lines are cranking as the 55-year-old Renfro morphs into tour-guide mode, his natural eagerness and easy humor revved up a notch, even though he has performed this routine countless times. 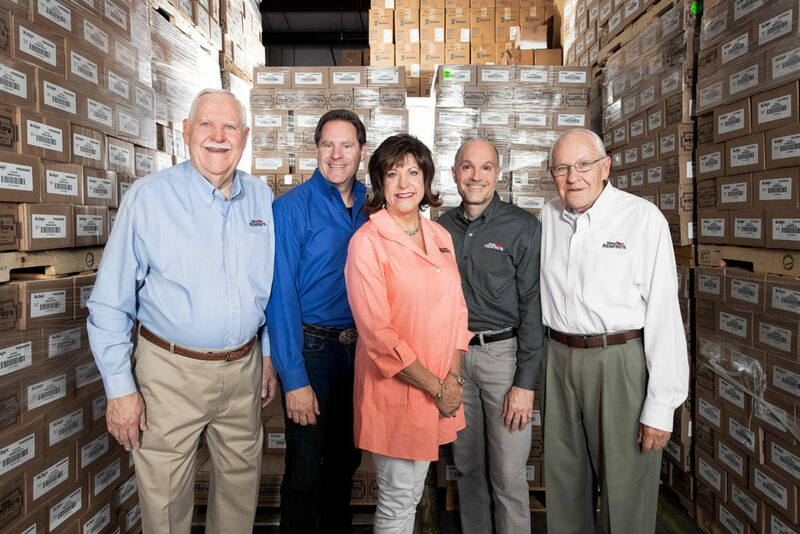 Doug Renfro is president of the family-owned and -operated Renfro Foods, launched in a Fort Worth bungalow 78 years ago by his paternal grandparents, George and Arthurine, as a spice and coffee distributor. Now housed in a sprawling acre of new buildings attached to a century-old edifice, it is the nation’s ninth-largest salsa brand, with $22.5 million in sales last year and $25 million projected for 2018. That’s substantially up from $3.8 million when Doug joined in 1992. The Cowtown building at 815 E. Stella St. has undergone countless renovations through the decades. Where a Model-A crankshaft once rotated gears on an industrial cabbage chopper for the family’s Dixieland-brand Chow Chow relish and bottled six jars a minute and hand-labeled, thousands of salsa jars now whir by on a high-tech line. The jars are robotically pulled from cases, sanitized, filled, capped, cooled, then labeled and boxed. A nearby production line ends with workers still manually packing cartons of picante sauce for a Tex-Mex restaurant. They move with a practiced, rhythmic deftness and, somehow, no glass jars cascade onto the floor. This particular order is part of the company’s “co-pack” or private-label business, which accounts for 35 percent of its revenue. Mrs. Renfro’s brands—named for Arthurine, who worked in the business for years, keeping the books—account for 50 percent. The remaining 15 percent comes from food-service bulk sales. The nondescript Renfro Foods complex has grown to take up much of a block in an inner-city neighborhood, across Interstate 35W and a few blocks from Fort Worth’s downtown. One friendly but stubborn resident refused to sell his home but allowed the Renfros to build around him. They gave the retired railroad worker a key to the gate that enclosed both his property and theirs, until he finally moved on four years later. The episode speaks volumes about this low-key, patient family. “We’re not screamers,” Doug explains, when asked how the multi-generational business achieved its longevity without painful rifts, feuds, or other pitfalls that often plague family enterprises. From left: Bill Renfro, James Renfro, Becky Renfro Borbolla, Doug Renfro, and Jack Renfro. Luckily for Renfro Foods, there has been no jockeying for positions or rivalries. Doug’s father, Jack, 81, hated sales but enjoyed running the production lines. His uncle, Bill, 83, who holds the chief executive seat, always enjoyed sales, accounting, and expanding the product line, until he and Jack reduced their roles in recent years to weekly visits to the office. Becky, who worked in the oil industry after college, has a flair for office management, running accounts receivable and payable, logistics, and much of the export business. She’s currently completing a two-year stint as chair of the Specialty Food Association, a major industry group that stages food shows in New York and San Francisco. James Renfro is Bill’s son, but he takes after Doug’s father Jack in many ways. Both were rodeo competitors, both are at home supervising and innovating production, and both spend their off hours working on their respective farms. Doug is more similar to Bill. He’s comfortable meeting scores of prospective customers at trade shows, giving talks to industry and civic groups, and being the public face of Renfro Foods. Both are adept at accounting. Doug got married, pursued his MBA at Southern Methodist University, and put in 60 to 70 hours during the week in EDS’ finance department. After several years, he had a team of MBAs and CPAs working under him, earned good money, and expected to see his salary double to the six-figure range—excellent remuneration for a 20-something in the late 1980s. He enjoyed the intense work atmosphere and frequent travel, but fatherhood took a lot of the fun out of it and tempered his corporate ambitions. At the same time, he found the work becoming more mundane. By 1991, he was ready to move on. “I’m action-oriented. I want to create. I want to be the controller of my life,” he says. Doug Renfro likes to experiment with new salsa varieties. After Doug’s initial misstep, he got it, filling in where he was needed, taking on more responsibilities, and quietly developing new products to expand the line. He formulated new salsa varieties, black bean and habanero, both of which caught on big. That encouraged Bill to suggest that Doug create a peach salsa. Up until then, the Mrs. Renfro’s brand had just one green sauce and three reds: mild, medium and hot “picante.” Doug later came up with chipotle corn and roasted salsa, and also updated Mrs. Renfro’s barbecue sauce, re-engineering it without artificial color, gluten, or high-fructose corn syrup. Those who know Doug Renfro likely will comment on two things: his sense of humor and his ability to manage numerous chores. “It helps being ADD with a bit of OCD,” he jokes. A major hurdle was convincing the older generation to accept a radical redesign of the plain white label that had single-color lettering. This gave the line a homemade, farm-stand look—a 1940s farm stand, Doug felt. He had prototypes drawn up by a local graphic artist who crafted a distinctive label with a woodblock illustration and colors that would brighten a grocery shelf. His cousins James and Becky agreed with the switch. “We knew we had to update the look if we were to continue to grow into new markets,” Becky says. “Jack was more on board than my dad; he really liked the white labels.” Bill worried that major customers had come to rely on the old look, and that sales might sour, but he went along in the end. And at trade shows soon after, Bill was surprised to find the same people who had praised the consistent look of the old labels now swooned over the improved packaging. “As soon as we had the new label design, we immediately got into supermarkets in the Northeast,” Becky says. Doug and his cousins have survived a number of challenges that could have ruined a less cohesive group. There was the Spanish customer who simply disappeared just as his large order arrived by sea. (The family found another customer to take the products, with a 15 percent markdown.) There was a massive product recall, due to the possibility of metal shavings in a key ingredient. Although the Food & Drug Administration confirmed there was no evidence that Renfro Foods received any of the contaminated ingredient, every jar from a production lot had to be pulled and destroyed. No one was harmed—save the Renfros. Many of the biggest supermarket chains have a policy of not ordering a recalled product for a year, even though the fault was with the supplier. 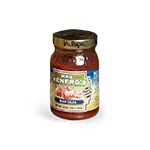 Then came the bankruptcy of its biggest customer For years, Renfro Foods handled production for another salsa company. “We supplied everything they sold,” Doug says. Shipments of the customer’s grocery and fancier gourmet gift lines grew to the point where the co-packing orders amounted to nearly 33 percent of Renfro’s total revenue. The Renfros knew they were in trouble when the customer made a rare request: a face-to-face meeting, with lawyers from both sides present. “I Googled their attorney and found his specialty was bankruptcy,” says Doug. He immediately got a recommendation for a well-regarded bankruptcy lawyer to represent Renfro interests: Bobby Forshey of Fort Worth’s Forshey & Prostok. “At the meeting, the customer announced it needed to file Chapter 11, but understood we wouldn’t want to keep making their products if we were going to have to eat the $1 million they owed us,” Doug says. All five family members and the Renfro attorney came up with a plan. They worked out an arrangement that gave the co-pack customer eight years to repay the arrears and, in effect, made Renfro Foods the “factor,” taking control of the customer’s accounts receivables. Forshey warned that without the deal, the debtor would certainly fail. The judge blessed the settlement, by which the customer basically had to give up enormous autonomy. Because of the Renfro’s reputation in the industry, grocery chains were willing to cooperate. “What resulted was the salvation of a seven-digit brand and all of our debt being repaid,” Doug says. Forshey believes such an outcome where the chief creditor is made whole after throwing a lifeline to the debtor is unique. Attorney D. Michael Lynn, a former federal judge in Fort Worth who taught advanced bankruptcy law at SMU and presided over the Mirant, Pilgrim’s Pride, and Texas Rangers bankruptcies, says he can’t call the salsa settlement unique. But, “it’s certainly clever,” he says, and reflects the flexibility of a Chapter 11 reorganization. 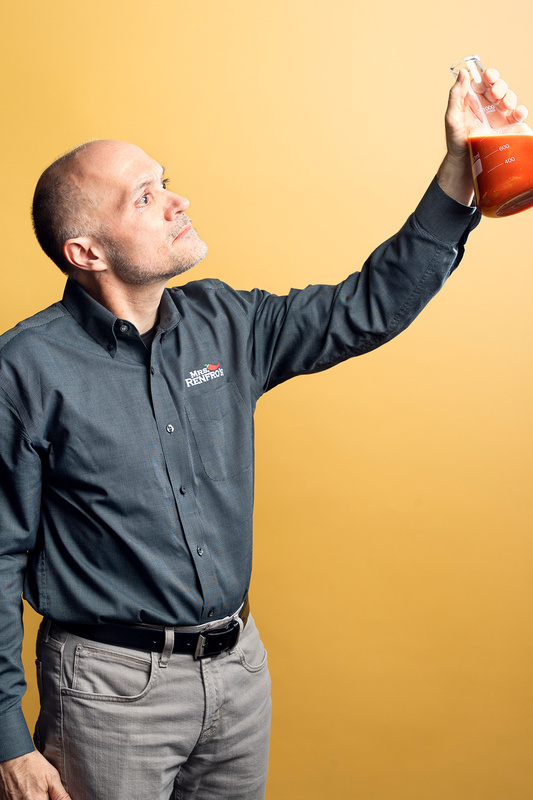 Among Doug Renfro’s favorite pursuits is developing new products from scratch. “He watches trends, he watches the market,” Becky says. His business studies and work experience at EDS and Northwestern in no way prepared him for the R&D work, but he did grow up in the business. Within three years, Ghost Pepper Salsa became Renfro Foods’s third-biggest seller, and it stayed in that spot for a decade. Doug was reluctant to spend money to enter a gourmet food contest in New York, doubtful his new ghost pepper grocery-store item could compete against upmarket products. It didn’t win, but one of the judges had been asked to recommend entries for a segment on Good Morning America. Only the Renfro’s Ghost Pepper Salsa made it on the air, resulting in nearly a minute of national television exposure, Doug says.